I couldn’t believe I had been so careless, so cavalier, about one of my old hoes! Normally, I don’t try to use the older hoes for any actual hoeing, especially those with their original wood handles, for fear that the handles will snap off. But for some reason, I felt almost compelled to try out this one particular hoe. I still can’t explain why. I carefully took it down off the pegboard and proceeded to sharpen the head using one of my sharpening stones. Then I took it out into the vegetable garden and began to hoe. At first, it seemed to work quite well and I could tell it was well-made and had probably pleased at least one other gardener when it was shiny and new. But then without warning, I hit a half-buried rock and heard a sickening cracking noise as the old wooden handle snapped off right by the hoe head. “Raining Rabbits,” I muttered to myself, “I’ve done it now!” As I reached down to pick up the hoe head, now separated from the handle, I noticed for the first time that the handle was hollow and there was a rolled up piece of paper stuck up inside of it. Carefully, I pulled out the paper and unrolled it. I could hardly believe what I was reading. I had found the third secret to achieving happiness in your garden! Oh, yes, it made perfect sense, as did the previously discovered first and second secrets. Buy good tools because it will make your work in the garden more enjoyable. When you use cheap or poorly made tools, your focus is usually on the tool and trying to get it to cut or dig or hoe or whatever you are trying to do. You lose sight of the pleasures of being among the plants and flowers as you get soaked by a poorly made hose end sprayer. You get frustrated when your just mash the stem of the plant and don’t cut it off cleanly. You get tired trying to dig with a cheap shovel. But when you have good tools, you can enjoy gardening. You can focus on the plants and the garden. You can observe the bees and butterflies. As you reach for those pruners to cut a bouquet of your very own flowers to bring indoors, there is no thought other than “Snip, what a pretty bloom”. 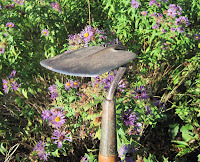 As you hoe in the garden with a well-made hoe, the weeds are easily cut off. When you dig… well, digging can be hard sometimes no matter how well-made our shovel is. You don’t even need a lot of tools when you have good tools. Start with the basics - a hoe, a rake, a shovel, a trowel, plus sharp pruners and a hose end sprayer that doesn’t leak and you can achieve happiness in your garden. I now had three of the five secrets to achieving happiness in the garden. As I picked up my broken hoe and took it back to the garage, I couldn’t help but wonder where and when I’d find the last two secrets. The fairies must be dancing all around you, Carol--you certainly are finding these secrets in the most unusual places! Good advice--perhaps some of the money I throw away on annuals could be better spent on a new hoe. You sounded quite convincing about finding that note inside the hollow handle. But sometimes even good quality tools cannot conquer half-buried rocks. Ah yes, the true path to happiness in the garden lies with having good tools -- and taking care of them! I'm afraid I'm a bit lax in that department and will need to do some de-rusting and sharpening before my tools get put to use this year. Great article! If you could please direct me to a hose-end sprayer that does not leak, I would be forever in your depth. I fear I've tried them all: cheap and expensive, metal and plastic, US-, European- or Asian-made, from independently-owned nurseries and big box stores, and invariably they all begin to leak a few months after being pressed into service. Most of them stop working altogether within a year. Can you provide a link, preferably to a video, that demonstrates how to sharpen a hoe? I've seen such information for shovels and spades, but not hoes, I don't think. Carol this is the one secret you talk about that I think few people realize. Nice post and series! Mine new one seems OK. I bought it a garden show--it was supposedly developed by firemen. I forget the name. Excellent advice! Have the right tool for the job, and having one that is well made make such a difference. That is such good advice. I was frustrated on Friday cause my Fiskars loppers need sharpening. They were gnawing instead of cutting. Not only buying the best tools you can but using the correct tool for the job is of great significance. Good point, they will last you for years....unless you accidentally thow your Felco pruners in the trash like I did a few years ago! I'm still mourning their loss. Carol, I'm enjoying learning your secrets and look forward to the remaining two. They've definitely resonated with me, especially given how much renovation the gardens will need in the months to come. This is a wonderful post. You have a gift of sharing the knowledge of the garden world. My favorite tool is this little hand tool that has a long end to help remove dandelions! I couldn't live without it! Carol - I so much enjoy your wisdom and humor. Your postings always teach me, and send me on my day with a smile. I love your secrets to achieving happiness in your garden. Great advice. I'll spend money on good tools and take care of them, but still, I manage to destroy them. I'm on my third lifetime warranty on loppers...but maybe i shouldn't use them as hand held bush hogs. I laughed aloud at the "hose end sprayer which doesn't leak". Wow, nothing can dampen one's enthusiasm - and clothes - like a nozzle head which sends stray jets in your direction when watering the garden. I may be a cheapo when it comes by buying these, but are there some which actually survive more than one or two seasons?